If you are looking for a Kent roofer who provides all services, look no further! 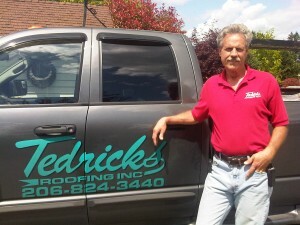 Tedrick’s Roofing Inc. is your safest choice! We have been a Kent roofer for almost 30 years and have a AAA rating with the Better Business Bureau. When you are looking for a Kent roofer make sure to check credentials, all the links necessary for this are located on our web-page! Make sure to check with Labor & Industry & make sure all licenses & insurance are current! !